Please note: Since we don't like to send annoying newsletters out we have decided to post our special offers on our Google+ and Facebook page. To get notifications of these simply use the follow button below and your Google account will update you when we add offers to this section. 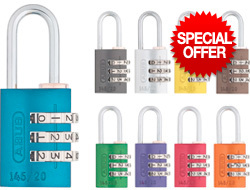 A HUGE 45% off on these 20mm brass padlocks which are the smallest size we do in this range. Small locks like these tend to be relatively insecure but ABUS are the best on the market so for securing anything like expensive luggage or laptops then these outperform cheap travel locks by a long way! 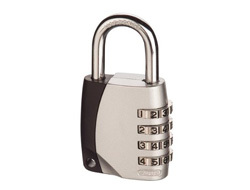 One of the best and most popular combination locks on the market. So popular ABUS put a design patent on it. We now have an excess of the 40mm version with 4 wheels and a 6mm shackle. Ideal for lockers really. Yours for a huge 50% discount. We've allocated 500 units for this offer. Ideal for Lockers! The ABUS 145 Series is state of the art and the only aluminium combination padlock on the market. They weigh in at only 40g and still use a hardened steel shackle. We hold 20mm, 30mm and 40mm sizes in 9 different colours each. They are the first choice for Peli Cases due to their high quality and low weight.